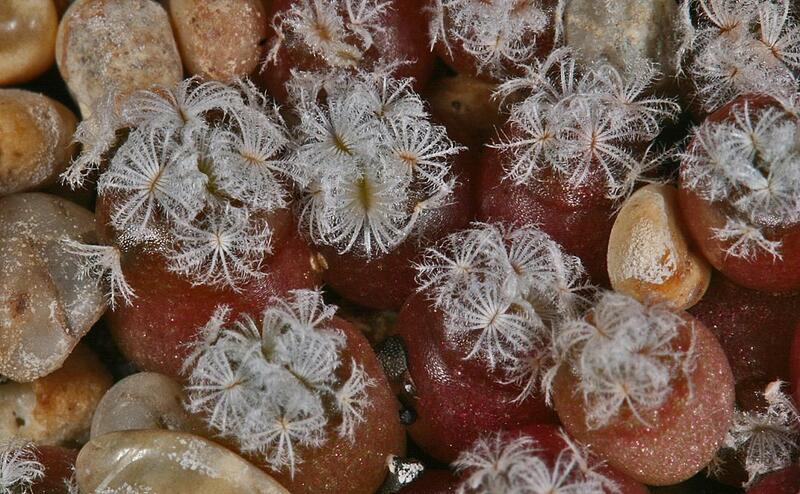 This is a brief and personal instruction how to sow cactus and succulent seeds. Raising seedlings in Florida may not be the same as raising seedlings in Sweden, because of light and temperatures! Therefore, try to translate this information to your own climate conditions. You can sow seeds any part of the year, but personally I start in December as this is the time when it slowly is getting lighter outside. In Sweden November til January is a period with very few light hours and it is mid winter. In Eskilstuna where I live, the sun may rise at 8.00 AM and go down six hours later and the temperature can be as low as -25° C. Because of the weak sun we have to give artificial light when raising seedlings. 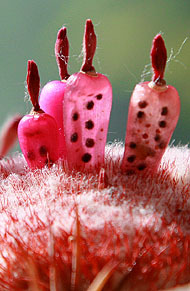 I use a very strong 400 watt lamp which gives the small plants very strong spines and compact bodies. If the seedlings are grown under too little light, they get elongated, light green and looks like unripe bananas! There are many different lamp types on the market, choose the one that suits you best (and wallet). 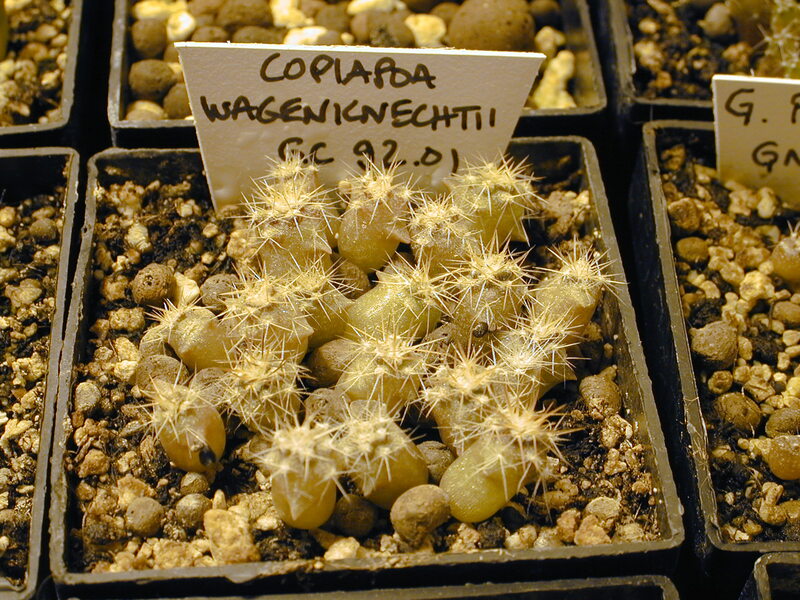 Some genera and species from cold areas can be tricky to germinate (Opuntia, Pediocactus, Sclerocactus, Maihuenia etc). A good method to get better result is to place the seeds cold during a month. I have placed Opuntia seeds in the freezer and they germinated fine. If you sow during winter and you live in a cold climate place the seed bags outside in a small box. Low tempereratures "stimulates" the seeds and you will (hopefully) get a better result. The soil mix must be well drainaged - that is very important! I use a mix consisting of 1 part "cactus soil" (which often content some grit), 2 parts perlite/vermiculite/lava or equalent mineral mixture. Instead of perlite/vermiculite/lava you can use normal grit, however, grit is much heavier and more compact, further more it does not absorb water. Pots: A plastic pot in size 5-6 cm is perfect for 10-50 seeds. The pots are placed in a "mini grower", a small plastic box with transparent cover. During the first weeks I also cover the pots with a piece of plastic to increase the humidity around the seeds. If any seedlings tend to rot, the plastic cover should be removed immediately (or the pot!). Some species germinates within a few days only, some take a month or more. When a pot/sort has germinated and the plants look strong, take them out from the humidity and place them directly under the lamp (if you have any). This is only one of the advantages by using many separate pots and placing them in a mini grower - they are mobile! Over watering is not a big problem for beginners - on the contrary, one of the reason for a bad germination is often that the soil mix has dried out! If the mix and seeds get dry the germination is stopped. So it is important that the soil mix is well soaked when you place them in the mini grower. Do not place small and sensitive seedlings in direct sunligh as they might get burned. As shown on the photo this is seen on the white and sunken base. The body is actually boiled! The seedlings should be re potted in a larger plastic pot or pan when they are about six month old. Some genera/species I recommend not be re potted the first year as they are so small are e.g. Blossfeldia, Strombocactus, Aztekium and Parodia. Give them one and a half or two seasons and then carefully try to moved them without hurting the tiny roots. 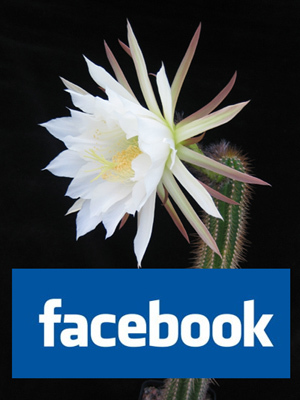 Some cactus seeds are very small, Blossfeldia, Strombocactus, Aztekium and Parodia to mention the most common ones. Generally the germination is not a big problem, but the problems arise after some months when the soil mix sometimes dry out or get fungus, sciara flies attacks etc. Genera with small seeds should be kept humid for at least 6 months. A simple way of doing this is by using a well cleaned glass pot (ca 10 cm high). Fill half the pot with a potting mix descibed above. Soak with water. Put it in a microwave owen for a minute or two and then let it cool down. Place seeds on the surface and seal the pot very carefully with transparent plastic and tape. Place very light but not direct sunlight. No watering is needed until you open it a half year later to repot them! Using the 'Fleischer Method', I have had great success with Strombocactus, Aztekium and a few tricky Parodias. 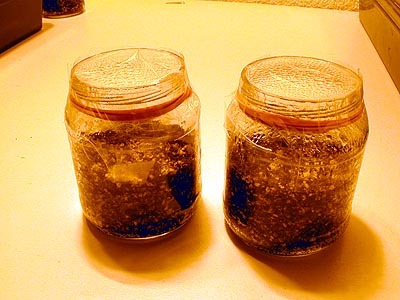 1) Fill pots with soil mix. 2) Soak the soil mix with water. 3) Place the seeds gently on the surface and add some grit on top. 5) Place the pots in the mini grower. Cover the pots with transparent plastic but let some air come in. Yes, problems can arise! The most common problems are fungus and sciara flies. For fungus attacks, add some grit on the surface and/or try to dry out the soil mix a bit (more air movement).